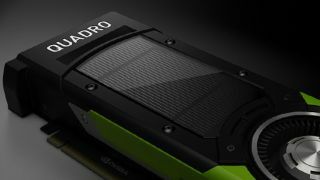 Nvidia has unveiled two new Pascal-based Quadro graphics cards, to follow on from its fresh consumer offerings (which run from the GTX 1060 up to the new Titan). The Quadro P6000 and P5000 are the company's heavy-duty workstation-targeted cards, promising much faster performance for the likes of scientific and engineering workloads, VR, demanding video processing and so forth. The P6000 sports 3,840 cores and offers a total of 12 TFlops of compute power, along with 24GB of GDDR5X memory. Nvidia claims it boasts up to an 80% increase in performance when run with the firm's own internal VR benchmarks, compared to the previous generation (Maxwell) cards. The maximum power consumption of the card is 250W, and you get one DVI-D port, and no less than four DisplayPorts – and because these are DisplayPort 1.4, the card is capable of coping with no less than four 4K monitors running at a refresh rate of 120Hz. As for the P5000, that offers 2,560 cores with 8.9 TFlops of compute power and 16GB of on-board memory. It can chug 180W going full-pelt and offers the same complement of ports as the P6000. The new Quadro offerings should arrive in October with exact pricing still to be confirmed, although it's expected that these cards will be pitched similarly to the previous Quadro models. These announcements were made over at Siggraph 2016, where AMD also had some big revelations in terms of workstation graphics cards – the juiciest of which was the new Radeon Pro SSG which incorporates an SSD into a video board. But AMD's more affordable workstation offerings are topped by the Radeon Pro WX 7100 which offers 5.9TFlops in terms of double-precision performance.